Dr. Lorna grew up on a cattle, corn and soybean farm in central Illinois, showed cattle in 4H, drove tractors in the fields all summer and owned many horses. She received her BS and DVM degrees from the University of Illinois in 1973. She married Wayne Lanman, who later served as Mayor of Charleston, IL. She owned three veterinary practices in Illinois from 1975-1995, and served in many offices and committees of Zonta, American Business Women's Assoc, Rotary, and Chamber of Commerce before she semi-retired with her husband and mother to Arizona. She was invited to join the West Coast Veterinary Medical Assistant Team, a Federal disaster response team in the National Disaster Medical Systems on which she has served as Administrative Officer, Deputy Team Commander and for the past 5 years as the Team Commander of the West Coast National Veterinary Response Team. As a member of the disaster team, she was deployed to Hurricane Floyd in 1999, the first deployment of 2 entire veterinary teams. She was also deployed to large wildfires in NM and Arizona, to special events such as the Special Olympics in Alaska, the 2002 Olympics in Salt Lake City and the Democratic Convention in Los Angeles in 2000. She accepted the invitation of USDA to assist during the Foot and Mouth Epidemic in England in April/May of 2001, a disaster of more than 10 million deaths of cattle, pigs and sheep before the disease was eradicated;and served 3 ½ months in Virginia assisting USDA during the Avian Influenza outbreak, where more than 5 million birds were destroyed from the turkey and chicken farms of the Shenandoah Valley before the disease was stopped. Following the attack on America on September 11, 2001, Dr Lorna was deployed as an administrative officer to the United 93 crash site in Pennsylvania, then to New York to the World Trade Center to provide veterinary care to the search and rescue canines. She has also been a disaster responder to Hurricanes Katrina, Rita, Gustav and Lilly. In 2002, she accepted the position as Assistant State Veterinarian at the Arizona Department of Agriculture. Her main duties were to coordinate the animal disaster planning and emergency response for the Department of Agriculture throughout the state, in addition to supervising the Animal Health and Welfare Officers in the southern half of the state. She assisted the state response to the Exotic Newcastle Disease outbreak, a foreign animal disease that occurred in California, Nevada and Arizona, along with the first Tuberculosis outbreak in Arizona in many years. She is a member of the Maricopa County Animal Response Team and serves as a disaster responder with American Humane Association. She served as President of the American Academy on Veterinary Disaster Medicine and the Veterinary Emergency and Critical Care Society’s Exhibitor Coordinator and staff member. 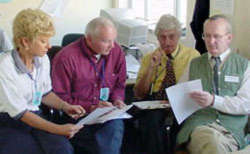 Dr. Lorna was the first VMAT member to be invited to attend USDA’s Foreign Animal Disease Course at Plum Island, NY, and received the Distinguished Service Award from the National Disaster Medical System She also traveled to Jerusalem, Israel in 2003 as an invited guest to the Hadassah Medical Organization’s First International Mass Casualty Seminar. Lorna has enjoyed traveling with her boyfriend, mother, friends and colleagues as members of veterinary educational groups to many countries around the world. Dr. Lorna now owns and manages PETSVET, LLC Animal Hospital and Mobile Clinic in Surprise, AZ and resides in Sun City West. She enjoys working with a dedicated, professional staff that takes great pride in treating her clients' pets as if they were her own pets.